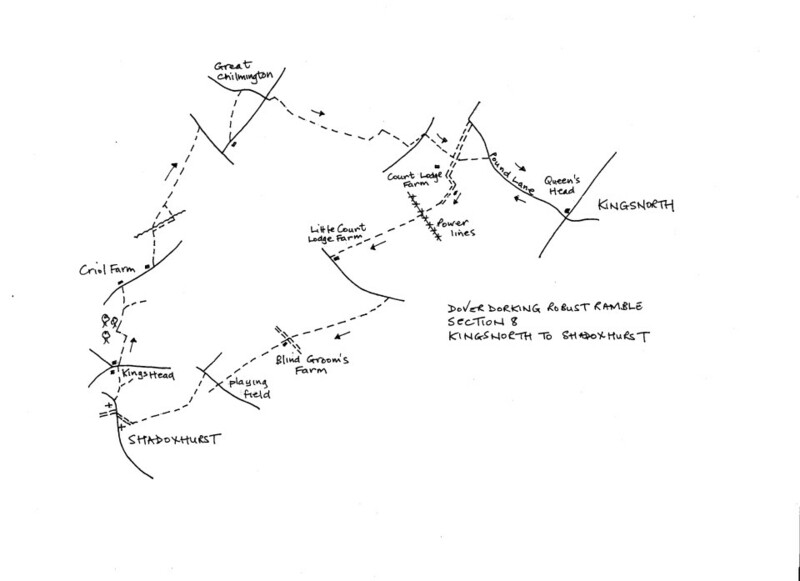 Comment A more straightforward walk than the previous sections in pleasant countryside. From the front of the Queens Head pub, turn right on the road down the side of the pub, called Pound Lane. This is part of the Greensand Way. After ½ mile, look for a stile and footbridge on the left. Leave the road over these into a field. Head diagonally right across the field to a stile leading to a tarmac entrance drive. Turn left on this drive (leaving the Greensand Way), and soon pass Court Lodge Farm on the right. Keep on the drive as it goes first left then right by farm buildings. At the end, go through a metal fieldgate into a paddock. Go ahead through more gates and reach a point just before power lines where a hedge comes down on the right. Keep forward by a hedge on the right which bears diagonally away to the right under the power lines. Keep on for ½ mile following the hedge, to Little Court Lodge Farm. A metal fieldgate leads to a busy road. Turn left on the road, first with a pavement, then a walkable grass verge, then, when houses begin, nothing at all. Take great care as cars speed along here. Soon a footpath leaves the road on the right. Cross a stile and bear diagonally right, up the field, to another stile where a wire fence meets a line of trees and bushes. Cross and keep on in the same direction, across an open field to a corner of a line of trees and bushes. Continue in the same direction with the hedgeline on the left, eventually passing through a metal fieldgate to a rough roadway at Blind Groom’s Farm. Cross the roadway to a footpath and stile at the right of the farmhouse. Walk forward with the farmhouse on the left. Cross an open field and enter another, now with a hedge on the right. Keep on towards football pitches. Cross a stile into the playing field and reach a metal swing gate in the far righthand corner leading to a road (Hornash Lane). Turn right along the road ignoring a footpath opposite. Soon reach another footpath, just before a road junction, going left down a path enclosed between high fences to a stile (the stiles on this section were broken and decrepit). Cross two horse paddocks and a final stile into a large field. Bear gently right downhill to the far righthand corner and a footbridge and two broken stiles. Shadoxhurst Church can be glimpsed ahead. Keep across a field towards the church. Aim just right of the churchyard. By a wooden fingerpost, cross a broken stile by a house onto an access road. Walk along this to a junction with a splendid village pump. Turn right up the road to a Methodist Chapel. Keep on along the road looking for a footpath going off right down the side of a house by a tall garden fence. Turn along this to the end. Go through a gate into a field and bear left across to a stile. Over this, go down towards a distant terrace of houses. At the bottom emerge into the car park of the Kings Head pub and the end of the section.